A Colorful Collection of Handcrafted Goods from the Mexican Mercado. Open-aired mercados, filled with earthy aromas, mountains of colorful fruits and vegetables, handmade flowers, palm baskets, great arrays of articles of every use, quaint cantinas and hard working folk, markets are Mexico's magical center. Our Mexican market place collection invites you to create the color, texture, and atmosphere of Mexico's mercados in your own decor. Be creative with our paper mache fruits and veggies, ristras, glorious paper flowers, molcajetes and wooden bowls. 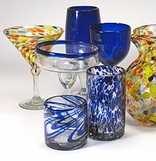 Add a touch of Mexico with our handblown glassware, market bags and Mexican fiesta banners. 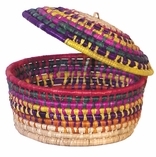 Click on the Mexican Mercado sections below to see all of our colorful Mexican market decor.